In honour of St. Patrick’s Day coming soon I wanted to share a couple more rainbow themed printables with you! These Rainblo Pops are just PERFECT for the occasion! Add one of the labels below for a fun little party favour or classroom treat. Download Over The Rainbow for You printable here. After you print and cut it out, punch two holes in the left side for the sucker stick to slip through and that’s it! I’ve had many people downloading these to use these for Valentine’s as well as St. Patrick’s Day! These would make a cute (and inexpensive) treat to send in the kids lunches for St. Patrick’s Day or for them to give out to their classmates. I just love this little collection of rainbow quotes. 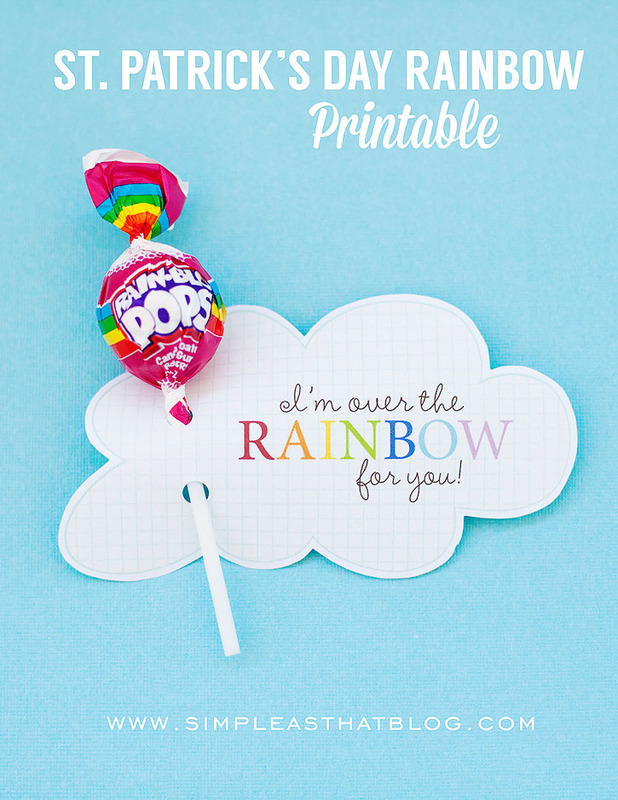 Print and attach a quote to a Rainblo Pop (I used double sided tape) or use for cards, a mini bunting, cupcake toppers, etc. As always, if you make something using my printables I’d LOVE to see what you come up with! 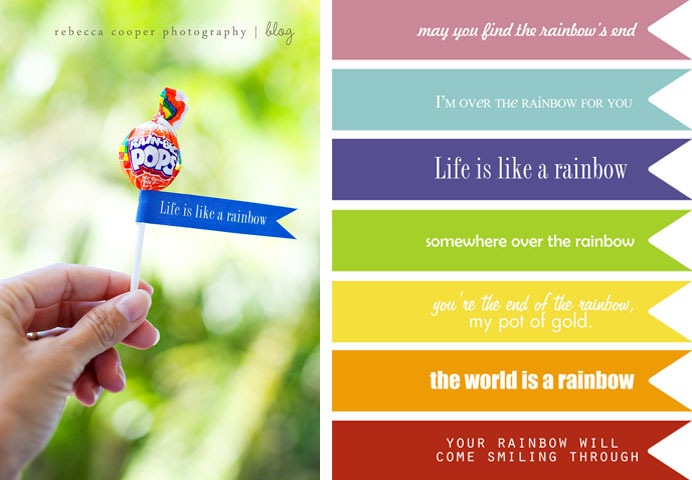 Download Rainbow Quotes printable here. Looking for more St. Patrick’s Day fun? 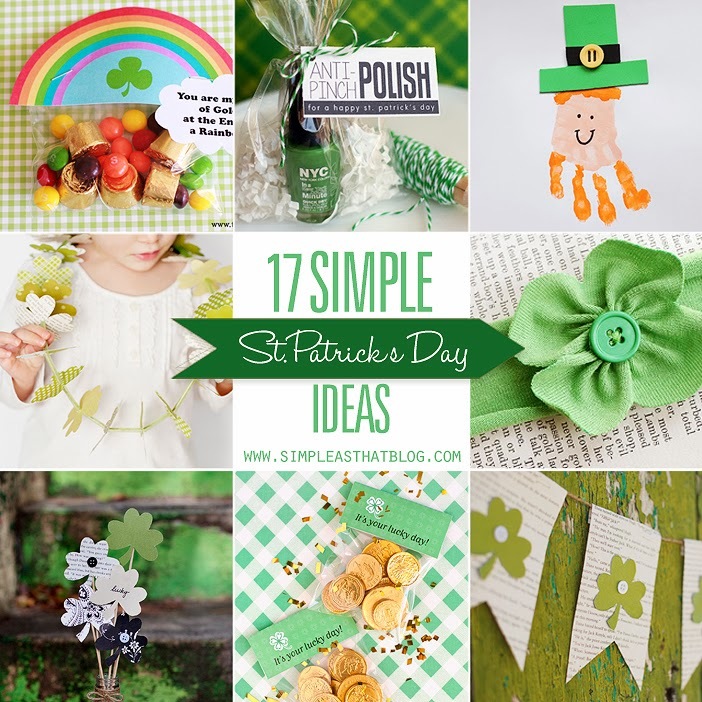 Check out this roundup of 17 Simple St. Patrick’s Day ideas and visit my St. Patty’s Day Pinterest board! I’m linking up with I Heart Nap Time, Lil’ Luna, Somewhat Simple, Tatertots & Jello and Today’s Creative Blog for Link Party Palooza! 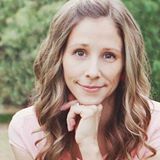 Follow Rebecca – Simple as That Blog’s board St. Patrick’s Day on Pinterest. These are soooo cute, Rebecca! I’m sooooooo happy that you have a printer now and these printables are all super cute! Love them. U r amazing! Love these! And way to go Randall! (ps big ward changes happening Sunday!). Hope all is good ttys! I love the last rainbow quote because we’re big Disney fans. 🙂 Thanks for the printables! So happy for you for your printer! LOVE this! Yay for the printer! Really cute. Thanks for sharing! Love these freebies!! Thanks so much for sharing them with us! I didn’t realize you didn’t have a printer! That is crappy! Glad Randall found you one!!! SUPER cute printables!!! Thank you so much! I love your blog and find it so refreshing and inspiring. So fun! I’d love for you to link up at my new Tuesday Time Out! Love, love these printables. My little guy was just asking if we could do something for his class…off to the store I go for some Rainblo Pops. Thanks so much! I LOVED those when I was little. I still know the song from the commercial. I’ll be singing it all night now. =) Thanks so much, I’ll be linking. Where can I find those Rainbow Blo-Pops??? I was at Target today and they only had the regular ones.. Would love to know so I can put these together for my son’s class tomorrow. thanks!! These are so sweet! So STINKIN’ cute that I had to share with my facebook fans. Rainbows AND Lollipops!! You had me at ROYGBIV. Ill be printing them for my daughters rainbow party in august. Ill email pics then x.
I’m a new follower of your blog and totally in love with these printables! Thanks for sharing. Help! I cannot find the rainbow blo pops anywhere! BEST COLLECTION OF SAINT PATRICKS DAY QUOTES. Thank you so much for sharing your talents! I’m putting together a rainbow party for my niece and these will be perfect! Thanks again!